it's cute how much you love lounging underneath the christmas tree on the tree skirt. 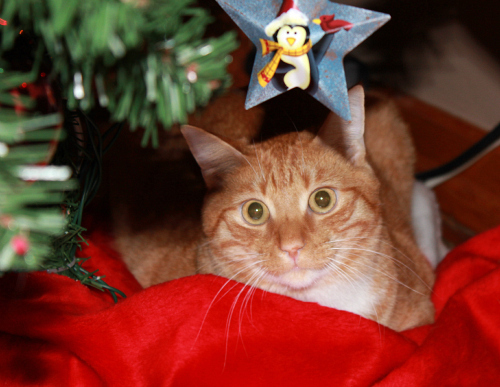 it's not so cute how much you love climbing the christmas tree and knocking ornaments all around the house. i'll let it pass because you were such a good boy at the vet this week for your check up. thanks for taking it easy on my wallet this time . . . not. there are weeks when we have tortellini for dinner three nights in a row because i just can't seem to get my act together, but then there are weeks like this when i actually get my act together. high five! thanks for the most amazing chicken that feed us all week! a-w-k-w-a-r-d. i swear sometimes work is just like high school. sometimes in the afternoon you send me pictures of kittens that you find on pinterest just to make me smile and to give me an afternoon pick-me-up. i love this. A crockpot would make cooking so much easier on those lazy days when I don't want to do anything (am I the only one?!). He never complains (I have a good man! ), but I know it would make Brian happy if the two days a week he works late there was an actual meal waiting for him when he got home instead of me eating instant mac n cheese those nights. I could throw chicken in the crockpot in the morning and we both could eat a nice meal those nights! Haha. I seriously need to add this to my wishlist. I don't know why I didn't think of it before! Love the picture of kitten under tree with penguin ornament. How could such a cute kitty ever get into trouble?? ?